Jack Lobdell felt that the stock Explorer leaf spring mounts weren't up to the task of serious off-roading. After all, a well placed rock could easily put a stop to your Explorers motion if it happened to get caught up in the spring mount. Jack came up with a design for a shock mount skid plate, the plate provides a flat surface for rocks to slide over and also has angled approach and departure surfaces. The U-bolt threads and nut are also completed protected by the skid plate, yet they are easily accessible through access holes. 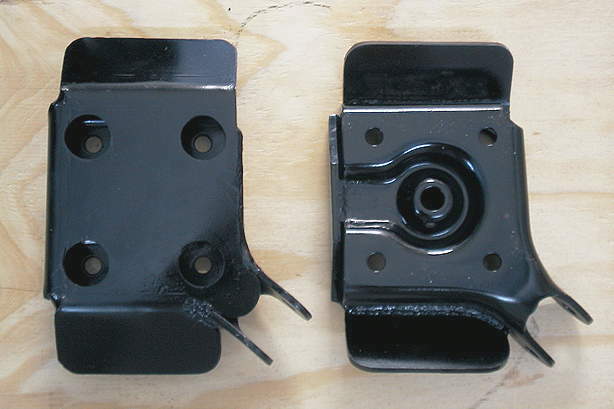 These skid plates start with new shock mounts from Ford. 1/4" plate steel is then flame cut to the proper dimensions and ground smooth. The plate is then bent to fit around the stock spring mount and finally it is MIG welded in place along all of the seams. This is one tough piece! The problem with the stock mount is evident in this photo. A rock can find it's way up into the mount which can hang you up and bend your u-bolts. 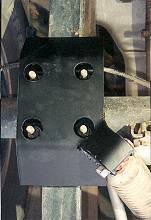 The shock skid plate provides a smooth surface for rocks to slide over. No more hang ups or bent bolts.